In a study published in the journal Science, U.S. Geological Survey researchers allegedly observed large, steep cross-sections of water in the form of ice under the surface of Mars. New data from NASA’s Mars Reconnaissance Orbiter (MRO) revealed the existence of clean water ice reserves beneath the Red Planet’s surface. In a study published in the journal Science, U.S. Geological Survey researchers allegedly observed large, steep cross-sections of water in the form of ice under the surface of Mars. The frozen water deposits were found in eight different regions of the planet where eroding slopes have exposed them. According to the scientists led by Colin Dundas of the USGS’ Astrogeology Science Center in Arizona, the eight Martian regions that have slopes as steep as 55 degrees, revealed further information about the internal layered structure of the underground ice sheets first discovered in the planet’s middle latitude last 2016. Aside from the discovery of the ice deposits, the researchers were also surprised to find that they could potentially be mined. Apparently, the reserves begin at depths as shallow as one meter up to a hundred meters into the planet. This new information is now being hailed by space scientists as a significant game-changer in our quest to colonize Mars. In 2002, first signs of shallow ground ice at high latitudes were detected by the NASA Odyssey mission. Then, the NASA Phoenix mission in 2008 was able to dig up water ice at its landing site near Mars’ north pole. These findings further strengthened scientists’ belief that there are water reserves locked underground on the red planet. Then in 2016, the Mars Reconnaissance Orbiter discovered the water ice exposed by the erosion in the mid-latitudes of Mars. Not much is known about these layers of ice until Dundas and his team published their study. According to the data gathered by the researchers, the ice sheet may actually hold as much water as the Lake Superior in North America. 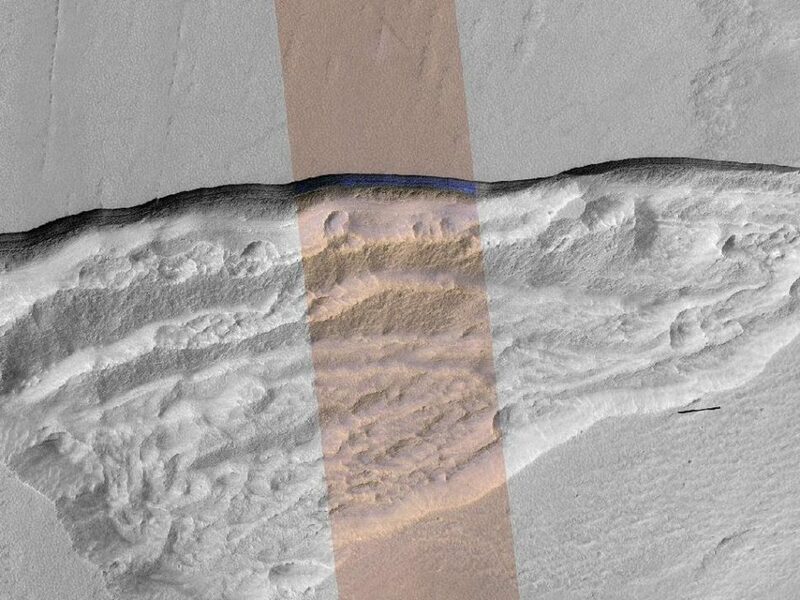 Further examination of the scarps that have been exposed to Mars’ atmosphere by the MRO’s Compact Reconnaissance Imaging Spectrometer confirms that the bright material initially detected is indeed frozen water. Furthermore, the Thermal Emission Imaging System camera onboard the Odyssey also helped researchers determine if the images they acquired are not just thin frost covering the planet’s ground. Dundas and his team speculate that the ice originated as snow that fell in waves over millions of years ago. While some solid material may have found its way in between snow events, the researchers believe that the surrounding ice is clean. While the existence of water ice underneath the surface of Mars increases the possibility of colonizing the planet someday, it still doesn’t guarantee anything. The ice sheets are found 55 to 60 degrees north or south of the equator where temperatures can drop extremely low, making it difficult for future astronauts to gain access to them. Still, scientists remain optimistic and are determined to send the first manned mission to Mars by 2030. Do you believe that the discovery of ice on Mars increases potential habitability? Let us know your thoughts in the comment section below!